Caper film about the theft of a jeweled dagger from an Istanbul museum. In his 1955 heist film classic, 'Rififi,' director Jules Dassin crafted a hard-boiled, noir influenced crime flick that offered a tense and cynical look at the intricate minutia of professional thievery. For his 1964 heist film classic, 'Topkapi,' Dassin once again returns to the world of crime, but this time he drops the hard-boiled cynicism and replaces it with... some good-old-fashioned bumbling comedy! A silly, fun take on many of the dark and serious tropes that the director previously helped create, the movie is a delightfully entertaining caper. And thankfully, despite the decidedly lighter tone, Dassin still shoots the film with expert precision, maintaining palpable tension while simultaneously trading in bullets for laughs. 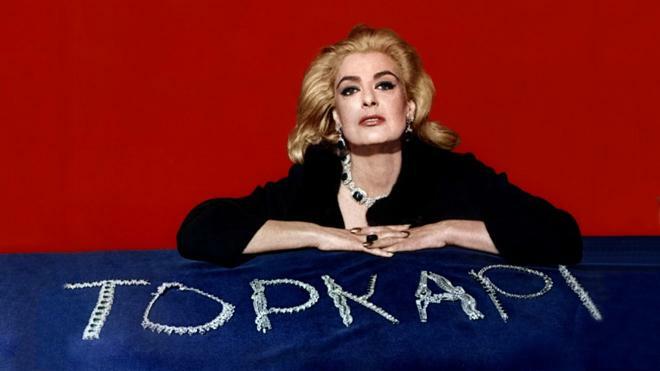 After becoming obsessed with stealing an emerald dagger from the Topkapi Palace in Istanbul, Elizabeth (Melina Mercouri) seeks out the help of her former lover, Walter (Maximilian Schell), to plan the heist. Together, the veteran criminals hatch an intricate plot, but the entire operation is put into jeopardy when a bumbling small-time con-man named Arthur (Peter Ustinov) is thrust into the mix. Forced to improvise, the thieves attempt to pull off the robbery without getting caught, even as Arthur's incompetence and potentially strained loyalties make the mission more and more dangerous… and hilarious. To pull off this cinematic caper, Jules Dassin enlists the aid of a wonderful ensemble, and each performer gives their role a generous helping of personality and charisma. As the woman behind the entire operation, Melina Mercouri is simply enchanting, blending blithe sensuality with a slightly wild glint in her eyes. She has all the men in the story carefully wrapped around her finger and never takes her eyes off of the true glittering object of her affection. Meanwhile, Maximilian Schell brings all of the debonair charm and effortlessly suave sophistication one would expect from a globe-trotting master thief, serving as our cool-headed traditional leading man. We also get a requisite group of specialists in the form of Robert Morley, Gilles Ségal, and Jess Hahn -- whose characters are trained in gadgets, acrobatics, and strength respectively. 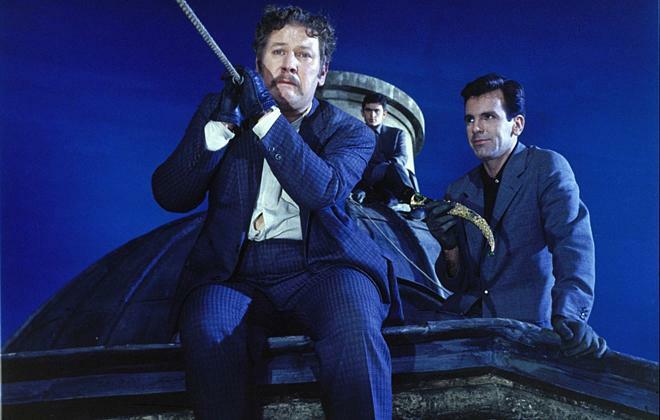 But as engaging as the entire group is, it's really Peter Ustinov who steals the show. In the role of hapless crook Arthur, the actor becomes the film's highlight, serving as our everyman screw-up amidst an ensemble of competent big-screen criminals. His reactions to his increasingly elaborate situations are priceless, and the movie simply would not work the way that it does without him (and his "beautiful eyelashes"). Hitting many of the same narrative beats that 'Rififi' chronicles, Dassin focuses on the tireless preparation and execution of an intricate heist, following the gang through each step of the plan. But while his previous crime film offered a comparatively gritty sense of realism, here the emphasis in on finding comedy through these same plot points and conventions, offering a playful spin on the director's own trademark sensibilities. To this end, most of the humor is fueled by Ustinov's fish-out-of-water predicament and various setbacks that form comedic obstacles during the heist, creating an amusingly bumbling quality that leads to several inspired laughs. With that said, it's not all mere fun and games, and Dassin does a great job of maintaining genuine suspense throughout the various set-pieces. The extended heist scene itself is of course a stand-out, and like the famous robbery in 'Rififi,' the director employs a similar focus on tiny details and specific steps. Likewise, dialogue is sparse and the sequence relies on precise editing to create an escalating, visceral rhythm that cuts back and forth to different aspects of the robbery at key moments. A preceding scene that follows the gang trying to give the police the slip is also very noteworthy, and uses a similar emphasis on editing and cuts to draw out the tension as the group gradually evades the authorities during a wrestling match. The rest of the runtime is filled with both subtle and overt bursts of style, including a rather flashy (and slightly out of place) pre-credits sequence that features Mercouri addressing the camera directly to set up the plot. Serving as a fun comedic twist on the director's earlier masterpiece, 'Rififi,' 'Topkapi' is an undeniably entertaining cinematic caper. It might not have the lasting impact or depth as that previous film, but the results are often riveting and humorous, balancing comedy and thrills with style. Together, both films offer a rather interesting contrast, illuminating how a similar story can be radically altered by tone. And with Dassin at the helm, the filmmaking always remains more than competent, even when the crooks on screen prove to be less so. 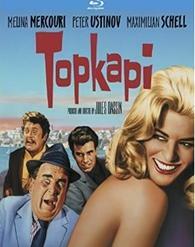 Kino brings 'Topkapi' to Blu-ray on a single BD-25 disc that comes housed in a keepcase. After some logos and warnings, the disc transitions to a traditional menu screen. The packaging indicates the release is region A coded. The movie is provided with a 1080p/AVC MPEG-4 transfer in the 1.66:1 aspect ratio. While the image improves as the runtime goes on, this is an occasionally rough picture that can be a little inconsistent. The source print is in decent condition, but some sequences show heavier damage than others. The opening scenes are especially rough with coarse grain, specks, and vertical lines. Thankfully, the image cleans up quite a bit from there, but there are moderate signs of age throughout including slight pulsing. Detail is also a little uneven, with some scenes exhibiting pleasing clarity that show off the Istanbul locations, and others offering a flatter, more washed-out appearance with less distinct fine textures and faded colors. To this point, a few softer shots here and there look like they might have been sourced from a different generation print. Thankfully, overall saturation is solid, with some vivid reds, greens, and purples that pop from the screen. Contrast is fairly well balanced but dark scenes do exhibit a faded quality. Minor signs of digital compression are also apparent. Though damage is never particularly distracting, specks and scratches are evident throughout and detail is a little irregular. It's far from pristine or demo worthy, but the transfer remains respectable. The film is presented with an English DTS-HD MA 2.0 Mono track along with English subtitles. Like the video, the audio is effective but does show some age. Dialogue is on the flat side and the track has an overall strained quality (and the lossless presentation certainly doesn't make any of the accents easier to understand). Music also has a fairly edgy sound at times. Effects work is decent, helping to add some bustling atmosphere to the movie's exotic locations, but frequencies have a tendency to muddle together a little. Thankfully, there are no major signs of pops, crackle, or hissing. The mix is basic and lacks range, but the mono design work is solid and certainly gets the job done. Theatrical Trailer (HD, 4 min) - The film's trailer is included in 1080i with DTS-HD MA 2.0 sound. Jules Dassin's 'Topkapi' is a playfully comedic and entertaining caper that offers a fun, light-hearted twist on his earlier masterpiece, 'Rififi.' Though serviceable, the video transfer and audio mix both show some clear signs of age. Unfortunately, the only supplement we get is a trailer. Still, the films itself is a very amusing heist flick and Peter Ustinov's scene-stealing performance is worth the price of admission alone. Recommended.